Chicaoji (chee-KOW-jee). What, it’s not a household name for you? Perhaps not yet. But if word catches on about this marvelous product, you may soon be seeing it in stores near you. Mrs. MHK happened to pick up a bottle of Chicaoji on a recent trip to Seattle, and then reaped the benefits during a dinner soon after her return. There are three main components to this marinade/dressing/sauce: chipotles, cacao (ka-KOW), and goji berries. If you’re a regular reader of this blog (and even if you’re not), you should be very familiar with chipotles. Cacao is the raw seed of the plant used to make chocolate, and goji berries are nourishing fruits, native to the China and Mongolia regions. Chicaoji is rounded out with cider vinegar, agave nectar, and salt. The combination is complex and very flavorful. I was not expecting as much heat as the sauce provides – it was actually a nice surprise. The sweetness of the goji berries helps balance out the heat, and the cacoa seed is utilized beautifully. The subtlety of the chocolate flavor is done to perfection, sort of like the use of chocolate in a good mole sauce – you can tell it’s there, but it’s slightly hidden within the other flavors. It adds depth and complexity to the sauce, and the vinegar and salt are measured out in just the right amounts. 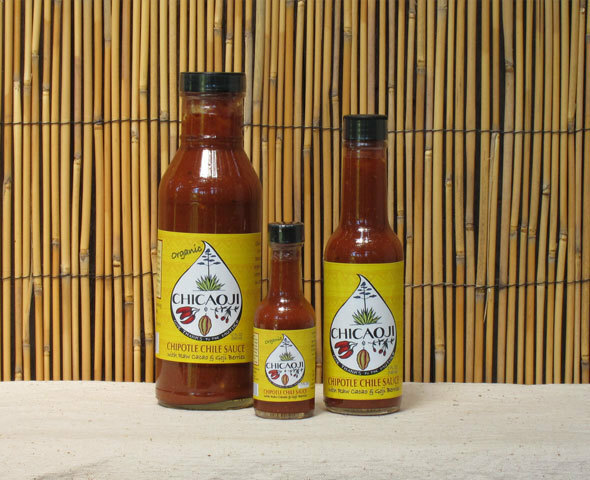 There are many uses for this sauce – we chose to marinate some skirt steak in it for about 30 minutes, and made steak tacos. 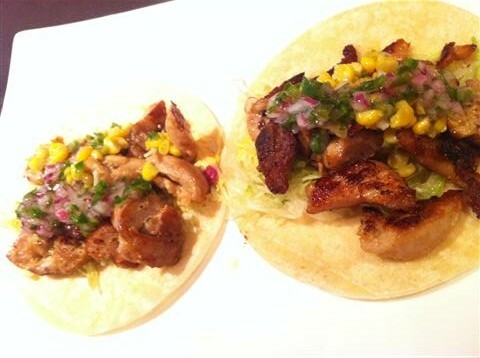 We then also used the Chicaoji as a sauce for topping the tacos. What was interesting was that the heat of the chipotles seemed to mellow out a lot during the cooking of the steak – eating the meat by itself was very flavorful, but not very spicy. But then adding the sauce to the taco provided that heat we were looking for. The tacos were fantastic – just steak, onions and cilantro, along with the sauce (very traditional street taco style). Chicaoji is made on Lopez Island, Northwest of Seattle, part of the San Juan Islands. You can visit the Chicaoji web site and check out all the info for yourself; you can even order their product. Chicaoji gets the MHK’s Seal of Approval…whatever that’s worth. Enjoy! Speaking in culinary terms, Los Angeles is famous for two things: the birthplace of hamburgers, and fabulous, authentic Mexican food. Those two characteristics are married beautifully in this recipe, found in the L.A. Times’ contest for burger recipes. The cemita is a Mexican sandwich, similar to a torta but the bread and fillings are less varied. 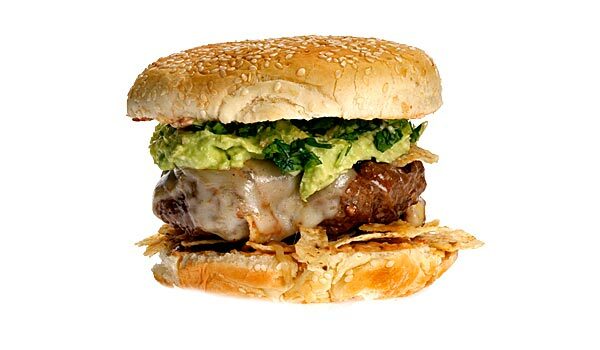 This recipe creates a hamburger cemita of sorts, featuring a chipotle-infused burger topped with a chipotle crema and mashed avocado. The spicy chipotles are balanced by the cool avocado, and the cheese adds a nice salty touch. Plus the cilantro and onions give it a nice tang. The result is a very messy burger, but one that’s full of the flavors of L.A. The original recipe called for a few ingredients that might be tough to find outside of places with large Latin-American populations, but this one should be accessible to all. Enjoy! In a small mixing bowl, combine the chipotle, adobo sauce, garlic, sour cream, and mayo. Mix until well combined. In a small mixing bowl, combine avocado and lime juice. Season with salt to taste. In a large bowl, combine the beef, chipotle pepper, adobo sauce, salt and pepper. Mix well to combine, but do not over mix. Divide the mixture in half and form the portions into patties to fit the buns. Heat oil in a skillet over med-high heat, then add the burgers to the skillet. Cook the burgers until set and browned on one side, about 3-4 minutes, then flip. Top the burgers with the cheese then cover the pan with aluminum foil. Cook an additional 4 to 5 minutes for medium burgers, or until the burgers have reached desired doneness. Spread the chipotle crema evenly on each cut side of the toasted buns. Sprinkle the cilantro over the crema on the cut sides of the bun tops. Top the bottom halves of each bun with a cheese-topped patty, a slice of onion and equal amounts of the avocado spread. Top the burgers with the bun tops and serve immediately. Get lots of napkins. Eat! When we planned out our weekly dinner menu for this week, we could never have imagined that last night’s dinner would have ever happened. Let me explain: illness befell the MHK’s executive chef over the weekend, throwing the kitchen into chaos as other staff members scrambled to create dinner for Saturday and Sunday nights. Certain ingredients weren’t used that had been planned, threatening to blow the entire week’s menu into oblivion. But last night, all became right with the world. The recipe that follows was thrown together at the last minute, and as we’ve seen before, that usually means it was a success. Mexico meets Jamaica with this dish featuring fresh ingredients and tons of flavor. The only thing you’ll need to seek out, possibly outside of your normal grocery store, is the jerk marinade. 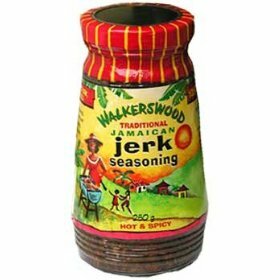 There are some brands in the supermarket, but try to find an authentic Jamaican import like this one. Ideally you’ll want to marinate the pork for 24 hours, but even after only 30 minutes it was great. We cubed the pork and then stir-fried it, but grilling and then cubing would probably be better. The super spicy meat is balanced marvelously by the sweet and smoky relish and the cool, creamy tang of the avocado and lime juice. This is summer on a plate; healthy and bursting with flavor. I’ll be blunt – it’s absolutely frickin’ awesome. Serve it with watermelon for a complete meal that your taste buds will thank you for. Enjoy! Coat the pork with jerk marinade and refrigerate, up to 24 hours. Oil grill and heat over medium-high. Grill 12-15 minutes per side, turning often until internal temperature reaches 160 degrees. While pork cooks, make the relish. Cook bacon in a large skillet on medium heat until crispy. Drain on paper towels and then chop into small pieces. Do not drain skillet – add corn, scallions, tomatoes and allspice. Cook over medium heat, stirring often, until corn is just tender, approx. 5 minutes. Transfer to bowl, add bacon and mix; let cool to room temperature. When pork is done, transfer to plate to rest. Sprinkle lime juice over the sliced avocado and place into a small bowl. Chop pork into bite-sized pieces and transfer to platter. 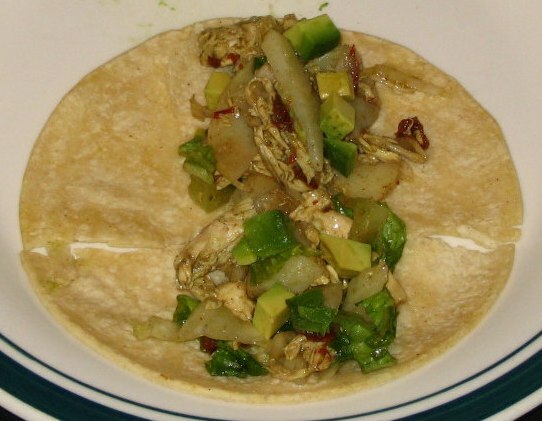 Serve pork, relish, and avocados with tortillas. Build tacos. Eat! The magnificence of the sandwich is a repeated theme here at the MHK, and today’s recipe highlights Mexico’s take on that culinary concoction: the torta. Tortas in Mexico represent the regions in which they are created – different areas use different breads and fillings for their sandwiches. The fillings run the gamut from pork, beef, and chicken to beef tongue, ham, and bacon and eggs. Traditional garnishes include avocado, beans, tomatoes, lettuce, cheese, and mayo or sour cream. Basically it’s a taco in sandwich form, and there’s nothing bad about that. This recipe comes to us from an unlikely place for Mexican recipes, the Hannaford Supermarket magazine. 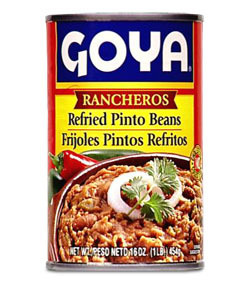 We omitted the beans, but if that’s your thing, add them when you’re building the torta. 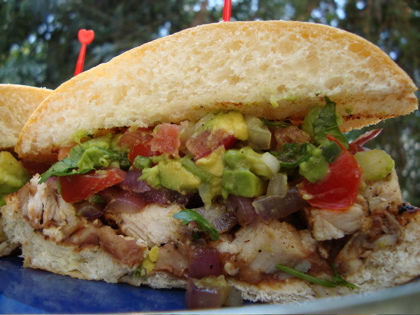 The tangy lime-avocado-tomato mixture and the smoky yogurt dressing give the sandwich amazing flavor, anchored by the juicy chicken pieces. Enjoy! In a small bowl, whisk together 2 tsp. of the oil, honey, vinegar, garlic, paprika, pepper flakes, and salt. Transfer to a sealable plastic bag. Add the chicken and turn to coat. Seal and refrigerate for up to 2 hours. In a small bowl, stir together the yogurt, chipotle, and scallions. Cover and refrigerate until ready to use. When ready to cook the chicken, heat remaining 2 tsp. oil in a large nonstick skillet over medium-high heat. Remove chicken from the marinade, discarding the marinade, and cook for about 3 minutes per side, or until cooked through. Tent with foil to keep warm. In a medium bowl, stir together the avocado, tomatoes, cilantro and lime juice. Split each roll in half and remove some of the bread from each half; reserve for another use. Toast the split halves. Spread the bottom of each roll with a very thin layer of yogurt mixture and top with cheese. Spread top halves of the rolls with remaining yogurt dressing. Place chicken on top of the cheese on each sandwich, then top with tomato-avocado mix. Place top halves of rolls on top of the avocado mix, press down to flatten slightly, and serve. Eat!